What are the Different Types of Faults in Electrical Power Systems? Electrical powers system is growing in size and complexity in all sectors such as generation, transmission, distribution and load systems. Types of faults like short circuit condition in power system network results in severe economic losses and reduces the reliability of the electrical system. Electrical fault is an abnormal condition, caused by equipment failures such as transformers and rotating machines, human errors and environmental conditions. Theses faults cause interruption to electric flows, equipment damages and even cause death of humans, birds and animals. Electrical fault is the deviation of voltages and currents from nominal values or states. Under normal operating conditions, power system equipment or lines carry normal voltages and currents which results in a safer operation of the system. But when fault occurs, it causes excessively high currents to flow which causes the damage to equipments and devices. Fault detection and analysis is necessary to select or design suitable switchgear equipments, electromechanical relays, circuit breakers and other protection devices. There are mainly two types of faults in the electrical power system. Those are symmetrical and unsymmetrical faults. These are very severe faults and occur infrequently in the power systems. These are also called as balanced faults and are of two types namely line to line to line to ground (L-L-L-G) and line to line to line (L-L-L). Only 2-5 percent of system faults are symmetrical faults. If these faults occur, system remains balanced but results in severe damage to the electrical power system equipments. Above figure shows two types of three phase symmetrical faults. Analysis of these fault is easy and usually carried by per phase basis. Three phase fault analysis or information is required for selecting set-phase relays, rupturing capacity of the circuit breakers and rating of the protective switchgear. These are very common and less severe than symmetrical faults. There are mainly three types namely line to ground (L-G), line to line (L-L) and double line to ground (LL-G) faults. Line to ground fault (L-G) is most common fault and 65-70 percent of faults are of this type. It causes the conductor to make contact with earth or ground. 15 to 20 percent of faults are double line to ground and causes the two conductors to make contact with ground. Line to line faults occur when two conductors make contact with each other mainly while swinging of lines due to winds and 5- 10 percent of the faults are of this type. These are also called unbalanced faults since their occurrence causes unbalance in the system. Unbalance of the system means that that impedance values are different in each phase causing unbalance current to flow in the phases. These are more difficult to analyze and are carried by per phase basis similar to three phase balanced faults. • Weather conditions: It includes lighting strikes, heavy rains, heavy winds, salt deposition on overhead lines and conductors, snow and ice accumulation on transmission lines, etc. These environmental conditions interrupt the power supply and also damage electrical installations. • Equipment failures: Various electrical equipments like generators, motors, transformers, reactors, switching devices, etc causes short circuit faults due to malfunctioning, ageing, insulation failure of cables and winding. These failures result in high current to flow through the devices or equipment which further damages it. • Human errors: Electrical faults are also caused due to human errors such as selecting improper rating of equipment or devices, forgetting metallic or electrical conducting parts after servicing or maintenance, switching the circuit while it is under servicing, etc. • Smoke of fires: Ionization of air, due to smoke particles, surrounding the overhead lines results in spark between the lines or between conductors to insulator. 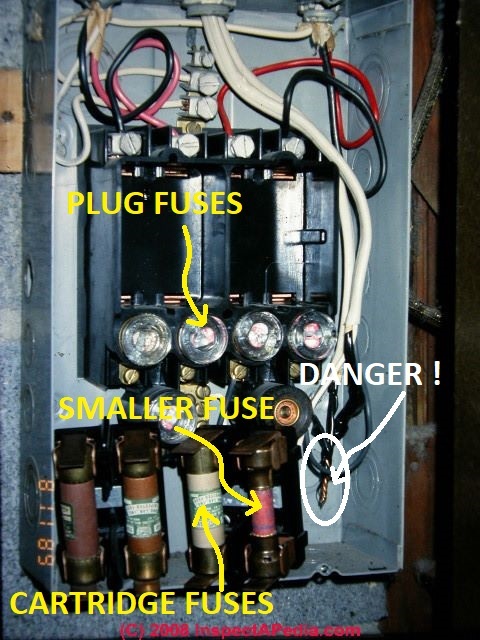 This flashover causes insulators to lose their insulting capacity due to high voltages. • Over current flow: When fault occurs it creates a very low impedance path for the current flow. This results in a very high current being drawn from the supply, causing tripping of relays, damaging insulation and components of the equipments. • Danger to operating personnel: Fault occurrence can also cause shocks to individuals. Severity of the shock depends on the current and voltage at fault location and even may lead to death. • Loss of equipment: Heavy current due to short circuit faults result in the components being burnt completely which leads to improper working of equipment or device. 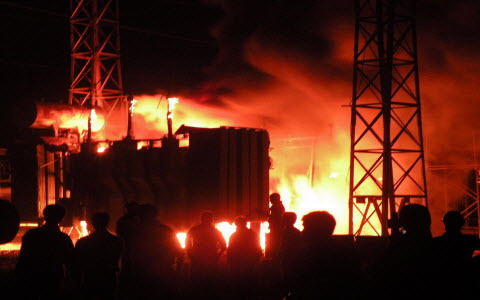 Sometimes heavy fire causes complete burnout of the equipments. 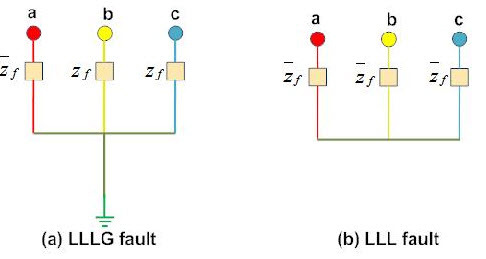 • Disturbs interconnected active circuits: Faults not only affect the location at which they occur but also disturbs the active interconnected circuits to the faulted line. • Electrical fires: Short circuit causes flashovers and sparks due to the ionization of air between two conducting paths which further leads to fire as we often observe in news such as building and shopping complex fires. It is possible to minimize causes like human errors, but not environmental changes. Fault clearing is a crucial task in power system network. If we manage to disrupt or break the circuit when fault arises, it reduces the considerable damage to the equipments and also property. Some of these fault limiting devices include fuses, circuit breakers, relays, etc. and are discussed below. • Fuse: It is the primary protecting device. It is a thin wire enclosed in a casing or glass which connects two metal parts. This wire melts when excessive current flows in circuit. Type of fuse depends on the voltage at which it is to operate. Manual replacement of wire is necessary once it blowout. • Circuit breaker: It makes the circuit at normal as well as breaks at abnormal conditions. It causes automatic tripping of the circuit when fault occurs. It can be electromechanical circuit breaker like vacuum / oil circuit breakers etc, or ultrafast electronic circuit breaker. • Relay: It is condition based operating switch. It consists of magnetic coil and normally open and closed contacts. Fault occurrence raises the current which energizes relay coil, resulting in the contacts to operate so the circuit is interrupted from flowing of current. 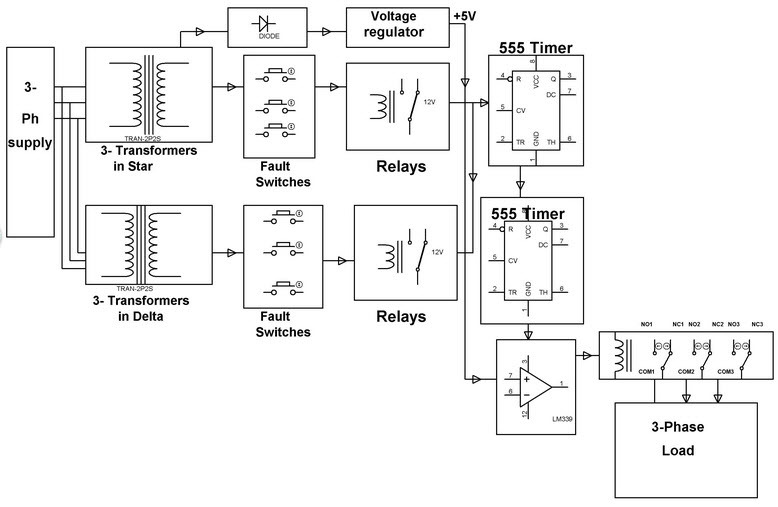 Protective relays are of different types like impedance relays, mho relays, etc. • Lighting power protection devices: These include lighting arrestors and grounding devices to protect the system against lighting and surge voltages. We can analyze three phase faults by using simple circuit as shown below. 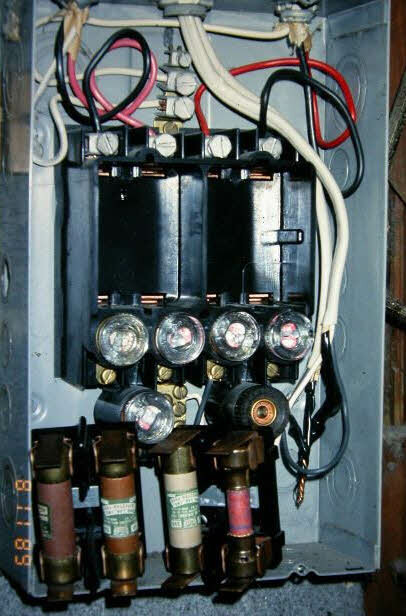 In this temporary and permanent faults are created by fault switches. If we press button once as a temporary fault, timer’s arrangement trips the load and also restores the power supply back to the load. If we press ON this button for a particular time as a permanent fault, this system completely shutdowns the load by relay arrangement. Hope that you got a basic idea about three phase faults. Thanks for your valuable time spending with article.Furthermore any queries regarding electrical and electronic projects, please write your feedback in the comment section below. keep up the excellewnt jo. Understandable explanation … NYC sir I want study relays in details so if you help me sir …. Sir next articles send also in my email . the information is indeed a greet important n helpful .